The UD apiary on South Campus is home to twenty-five hives translating to some 1.3-2.2 million honey bees, providing pollination services to the surrounding fields and gardens. The resident honeybees are an active part of the teaching, research and outreach programs in the Department of Entomology and Wildlife Ecology. 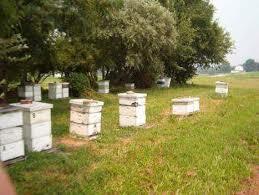 In addition to the hives on-campus, the University maintains three additional apiaries for research, outreach, and queen production. Deborah Delaney, assistant professor of entomology and wildlife ecology, who oversees the apiary and bee program, teaches ENWC 224, the beekeeping class, where each student stewards their own hive and learns bee biology and beekeeping skills. Students are encouraged to help with honey harvest and extraction and Delaney is currently trying to secure grant monies for a master’s student project that would utilize the colonies in the apiary.